Justice Karnan of the Madras High Court has passed a supplementary interim order, staying the Tamil Nadu Public Service Commission interviews for selection of Civil Judge (Junior Division). Granting interim stay on a an earlier suo motu order passed by Justice Karnan, a Division Bench of the Madras High Court, comprising of Justice S. Tamilvanan and Justice C.T. Selvam had ruled that “administrative control of the High Court is vested only with the Chief Justice and it is the prerogative of the Chief Justice to distribute business of the high Court both judicial and administrative.” They were of the view that suo motu power could be exercised only by the Chief justice in Public Interest Litigation. No other Judge other than the Chief justice can exercise such a power, without the discretion of the Chief Justice in a Public Interest Litigation. 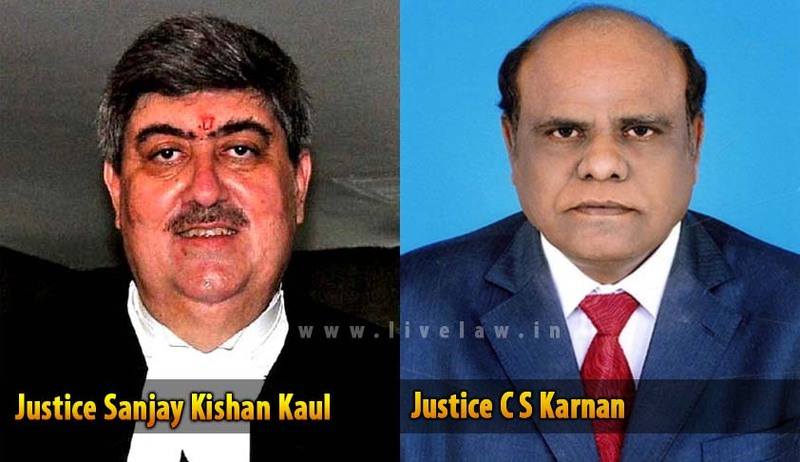 The Division Bench refused to go into the personal allegations raised by Justice Karnan in his order and delved only into the jurisdiction and propriety vested with Justice Karnan to suo motu pass the order stopping the interview. Referring to various Supreme Court decisions, the Court observed that the Chief Justice has full power, authority, and jurisdiction in the matter of allocation of business of the High Court which flows not only from the provisions contained in sub-section (3) of Section 51 of the States Reorganization Act, 1956, but inheres in him the very nature of things. (2)upon the direction given by the Chief Justice, if it is brought to the notice by any other Judges, in case of Public Interest Litigation. The Division bench hence granted interim stay on the order passed by the Single Judge. It is stated in the order that the order of Chief Justice directing the Registry not to list the suo motu Writ Petition initiated by Justice Karnan is an administrative order of the Chief Justice which “runs against the Judicial Order” of the court and is “against law and justice and National Welfare”. Justice Karnan hence directed the Registry to list the suo motu Writ Petition. It set aside the administrative order passed by the Chief Justice. “This Court further requests My Lord The Hon’ble Chief Justice to extend your co-operation without any interference with my Court’s proceedings and its Judicial Power in order to maintain the decorum of the Court and avoid an unhealthy practice of Judiciary in the interest of the general public. My deep request to My Lord The Hon’ble Chief Justice is to avoid ego and stop acting in an autocratic manner to protect democracy,” the order reads. The Judge directed the Registry to list the suo motu petition on 10.06.2015.